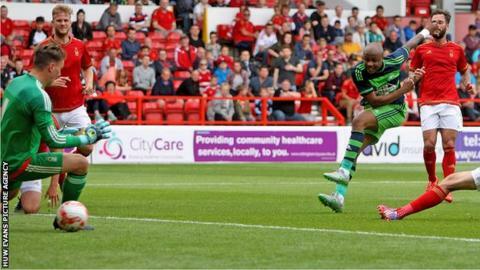 Andre Ayew scored his first goal since joining Swansea from from Marseille in a 1-1 draw at Nottingham Forest. Ki Sung-yueng and Ayew went close for Swansea in a first half when goalkeeper Dorus De Vries was not tested. Ayew fired-in left-footed from 10 yards on the hour, but Robert Teche headed an equaliser within 10 minutes. Swans manager Garry Monk did not use any substitutes with striker Bafetimbi Gomis ruled out with a hamstring injury. Gomis had been the subject of a transfer enquiry by Dubai club Al Ahli, which the Swans had rejected. He is expected to be fit in time for Swansea's home game against Deportivo la Caruna at Liberty Stadium on Saturday, 1 August.